LG HB620T. Catchy name, huh? File this one under “W” for “Weird”. The LG HB620T was a strange-looking clamshell phone that attempted to deliver something that customers didn’t really want, and ended up being horribly compromised along the way. There was a good idea behind the HB620T – and that idea was that people wanted to watch TV on the move. Ten years ago there was no 4G, 3G services was spotty and public WiFi wasn’t great either. But more critically, mobile data was extremely expensive in 2008 Vodafone charged £7.50 a month for about 4Mb of data per day, with each 15Mb after that costing another £1. High-quality mobile video would have been too expensive to watch for very long. The solution seemed to be to put a digital TV receiver in the phone itself. Early attempts, such as the Nokia N92, used a version of the common DVB system optimised for handhelds with the name DVB-H. The problem was that nobody really wanted to pay for the infrastructure to support DVB-H, so manufacturers instead tried to adapt phones for the more common household DVB-T. This meant that no additional broadcasting infrastructure was needed, but it wasn’t as easy to make it work in mobile handsets. 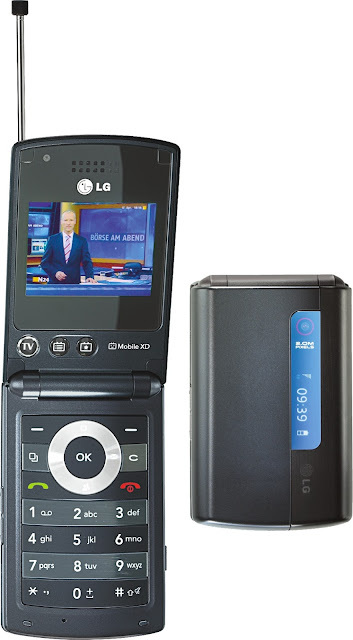 LG’s approach was to build a DVB-T receiver into a clamshell phone. Nokia had already done this years earlier with the N92, which was quite a chunky device – but it did feature a clever two-way hinge which allowed the 2.8” screen to be used in landscape orientation. But the LG HB620T didn’t do it that way: LG just made the clamshell wider than normal and squeezed in a quite small 2.0” display in landscape mode instead. The phone needed to use a large antenna to receive the TV signal, and the receiver wasn’t compatible with the digital TV service in many countries either. You might not be surprised to find out that the combination of odd design and poor features – plus the small screen – meant that the HB620T was not a success. The LG HB620T always was pretty rare, and if you can find one the prices tend to be €120 or more. As a device it service very little practical purpose, and you can actually get a 9” DVB TV for less than that. And of course these days you can just stream most things to an app instead..